I have found more peace in my life through the practice of mindfulness: being present and paying attention to the here and now. My self-appointed mantra is “Right here, right now” to help bring me back to the present when my mind invariably starts to wander. I have been trying to remember to stay mindful and, like any new habit, it can be challenging. I’m currently reading a book called Buddhism for Mothers to help build the habit. I read a blog post about picking two things–opening a door, and taking a seat–and remembering to to be mindful while doing those two things. In the course of one day, out of about 10 times opening a door and 10 times sitting down, I remembered to be present twice, so 10% of the time. Better than 0% (I like that Buddhism is also about not beating yourself up to much when things don’t go how you planned. I’m a little worried that being a good Buddhist means no plans at all, and that would be difficult for me). Every Sunday morning, I go to the Farmers’ Market and if my kids are with me, we order crêpes. I still tend to pronounce it “craype” rather than the french “crepp” but my kids don’t care. My daughter always gets the strawberry crêpe and my son gets 2 Citron (lemon, sugar and butter) on one plate. I love watching him eat them because he doesn’t believe in cutting with a knife and fork. He stabs the mound of crêpe with his plastic fork and then lifts the mass off the plate and takes bites out of it. At first I tried to correct his manners, but his method seems to work for him, and I’m counting on peer pressure when he’s a teenager to help correct a lot of these behaviors. I just have to ensure he stays friends with the kids whose parents nagged them about manners. This morning, my son was off on a trip with his dad, so my daughter and I visited the Farmers’ Market together. She placed her order for the usual with me and then skipped off to the coffee cart to order a Turkish Cappucino (espresso and chai) for me while I stood in line at the crêpe tent (I am so lucky to have a daughter who enjoys – for the time being – going off by herself to fetch me caffeine). I often rotate my crêpe choices but today decided on one Citron since my son was not with us. Timing worked out so my daughter emerged from the coffee store just as I was settling in to our usual sitting area next to the street musician, and we began to eat our crêpes to the tunes of bluegrass. “Right here, right now” popped into my head and I took a breathe and began to savor this weekly ritual. First, I placed the paper plate on my lap and enjoyed the warmth of the crêpe sinking into the tops of my thighs…not enough to hurt, just enough to know my breakfast was still hot. As the banjo player quickly picked the strings of his instrument and sang “Keep on the Sunny Side” (from the “O Brother Where Art Thou” soundtrack), I picked up my white plastic fork and knife and began my experience. I sank the fork into the crêpe and held the corner firm while I sliced into it with the knife until it separated and I struck the plate. I gently placed the knife on the side of the plate and switched the fork over to my right hand (my parents were ones who nagged about manners). 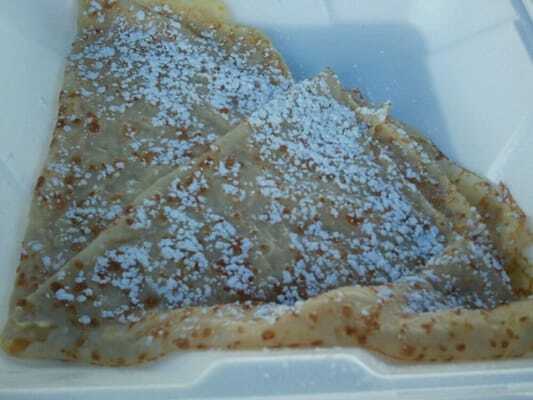 I slid the fork under the morsel of crêpe and slowly lifted it towards my mouth, inhaling the sweet smell and admiring the soft white speckles of confectioners sugar. I placed the warm bite into my open mouth and closed my lips around the fork, letting the warmth of the crêpe sink into my tongue as I slid the fork out, grateful for its delivery. I shifted my tongue slightly, so the slippery butter could spill out as my teeth slowly started to masticate this delightfully chewy package of citrus, sugar and melted cream. I couldn’t help but close my eyes and tune out the bluegrass as I slowly chewed and savored and enjoyed each bite. In between bites I enjoyed sips of hot, spicy espresso to wash down the sweetness of the crêpe and prepare my tongue for the next incoming gift. When I reached the last bite–the treasured fold of the crêpe, where the lemon, sugar and butter have been tucked away, never to touch paper plate or air–I repeated the enjoyment cycle one last time. As the remainder of the crêpe slid down my throat to join its brethren in my happy tummy, I smiled with satisfaction, mostly because I had stayed in the present for the entire time I ate the crêpe but also because by slowing down I felt satiated…not longing for more. I was happy with where I was, right there, right then. Right here, right now.